This letter is rather lengthy (2 pages) but I hope you will take the time to read it. And pass it on to your shipmates. It is a request for your assistance in returning the retired submarine, USS Razorback SS-394 to the United States from Turkey. 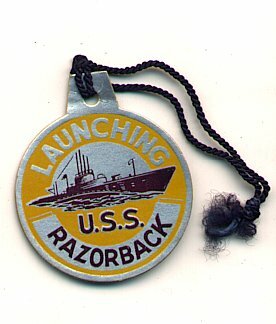 The USS Razorback was commissioned in 1943. It is the last submarine that was present in Tokyo Bay at the signing of the Peace Treaty ending WWII that has not been scrapped. She is also the only boat to have earned battle ribbons in WWII and Vietnam. Then she was turned over to Turkey, where she was in operation for nearly 30 years. That is nearly 60 years of surface and submerged operations. This is a tremendous testimonial to the quality of the boat and the crews that have maintained her through all these years. To save this history of WWII combat Patrols, Cold War Era operations and Turkish service for our next generations, and to keep the sacrifices made by Submariners and their vessels a living legacy, we are creating a joint US and Turkish museum commemorating this great Lady in North Little Rock, AR. The Mayor of North Little Rock, AR has received authorization from both the United States and the Turkish government for the transfer of the submarine to North Little Rock, AR. where this joint museum is being established. Our SubVets Organization has committed ourselves to obtaining the necessary funds of $1.5 to $2.0 Million in preparation for her making the journey, and to our bringing her home for Memorial day 2003! This is a tremendous undertaking and any and all assistance is sincerely appreciated. We will recognize each boat that supports our mission by placing the name of that boat on a plaque at the museum honoring donors with significant contributions. There will be the: Admiral level, $5000 or more - Individual plaques mounted in Memorial Park; Commodore level, $1000 - $4999 - Listed on a plaque with other contributors; Captain level, $250 - $999 - Listed on plaque with other contributors; Crewmember level, up to $249 - Acknowledged in Donors Deck Log kept on exhibit at USS Razorback Memorial. We would appreciate it if you would send this letter to each of your crew members, who in turn, could forward it on to their e-mail friends giving your boat even more opportunity to increase the cumulative amount of donations. Donations will be submitted individually, but can be credited to your boat, so please place the hull number of the boat in the Memo space on your checks. Arkansas Inland Maritime Museum Assoc. Let us know if you would desire a receipt for tax purposes. WE WOULD SINCERELY APPRECIATE YOU FORWARDING THIS LETTER TO ALL OF YOUR INTERNET FRIENDS.. Bud "Shag" Stratton, QMC(SS), USN Ret. A World War II submarine auspiciously named the Razorback will become the newest riverfront attraction in North Little Rock next spring. "North Little Rock now has a navy," North Little Rock Mayor Patrick Hays said at a news conference Tuesday along the Arkansas River, where the historic submarine is planned as part of a maritime museum. Hays made the announcement after returning Saturday from a 12-day trip to Turkey, where the Razorback has been part of the Turkish navy as the Murat Reis since being sold by the U.S. Navy in 1970. Turkey decommissioned the submarine March 1 and will donate it to the United States to become a museum piece in North Little Rock. The 311-foot-long submarine, among 12 present during the 1945 Japanese surrender to end World War II, could arrive in North Little Rock in time for Memorial Day weekend's Riverfest, Hays said. Little Rock and North Little Rock jointly put on the annual festival last year for the first time. Plans are for a crew to pilot the submarine across the Atlantic Ocean to the mouth of the Mississippi River, he added, as the least expensive way of transport. The maritime museum would add to riverfront development plans to draw or extend stays of downtown visitors to the shores of North Little Rock and Little Rock. "If they put it on the river over there, that would be a great place for it. And it would get it a lot of visibility," said Bill Tunnell of the Battleship Alabama Memorial Park, which includes the submarine Drum in Mobile, Ala. "But it is not a proposition where you're going to bring a vessel there, and it's going to be a profit maker. There's going to be some ongoing expenses." The maritime museum would be adjacent to or near a planned $5 million state Game and Fish Commission Nature Center, a possible aquarium and hotel complex, and Alltel Arena - all next to the Interstate 30 river bridge in North Little Rock. The $155 million Clinton library is under construction across the river in Little Rock. "It certainly could be a draw to the downtown riverfront area," said Randy Herlocker, president of the North Little Rock Chamber of Commerce. "With the connection to the Clinton library and [Little Rock's] River Market it can be just another jewel in the crown to make the riverfront even more popular. As part of the museum, Hays is also trying to secure the tugboat Hoga, which fought battleship fires during the 1941 attack on Pearl Harbor. Veterans' and submariners' organizations nationally have pledged to help raise funds to pay the $200,000 to $400,000 estimated cost to transport the Razorback from Turkey to Arkansas. If the Turkish navy can make the vessel seaworthy, transportation will cost less, Hays said. A national organization of submariners has 10,000 submarine veterans and 90 submarine base organizations, including one in Jacksonville named for the Razorback. "We're delighted the history of the submarine and the history of the Razorback will be available to the young people of this state," said Carl Schmidt, commander of the state's Razorback Base submarine veterans group. "We pledged to not only help get the Razorback here but to help get the Hoga here, too." The Razorback submarine is a natural fit for North Little Rock, Hays said, because of the city's military connections with Camp Robinson and the significance of the vessel's name - though the submarine is named for a reddish whale, not the University of Arkansas mascot. Not that it makes any difference, Hays said. "To all of the world," Hays said, "the Razorback is the Arkansas Razorback." North Little Rock could also benefit educationally from its new ties with Turkey, said Les Wyatt, president of Arkansas State University in Jonesboro, who was part of the delegation with Hays. An institute affiliated with ASU "to study the process of peace and peacemaking" between the United States and Islamic nations would most likely be in North Little Rock, Wyatt said, and collaborate with the Clinton School of Public Policy, included as part of the presidential library. "With the international component, we might weave together some thread for greater international understanding," Wyatt said.